Negligence resulting in personal injury are among the most prevalent cases litigated, and if you’re a victim of someone else’s negligence, you will want to hire a personal injury attorney in Las Vegas to pursue, and if necessary, litigate your case on your behalf. However, negligence cases are rarely cut and dried. Because an inquiry into liability for negligence involves an analysis of whether certain behavior was reasonable, whether a duty was breached (including whether a duty even existed), and whether the injuries the resulted from the behavior were foreseeable, a negligence determination is highly based in fact. Which means it is subject to interpretation and dependent on the credibility of evidence. To further complicate matters, it is not unusual for there to be multiple parties potentially liable for the injuries caused to the plaintiff, including the plaintiff. Where the plaintiff is at least partly to blame for his or her own injuries, doctrines of comparative or contributory negligence are implicated. Defendant Driver runs a red light and strikes plaintiff, who was speeding. Defendant Dog Owner’s dog bites and injures plaintiff, who was provoking the dog. Defendant Department Store does not remove spilled liquid from the floor, and plaintiff, who is wearing 12″ heels and not paying attention, slips and falls, injuring herself. Different states handle contributory negligence differently, but all states’ laws in this regard generally fall within one of three general categories: contributory negligence states, pure comparative negligence (or comparative fault) states, and modified comparative negligence states. In all three scenarios, the fact-finder (either the judge or jury, depending on whether a jury is impaneled for the trial) must hear all the facts and then make a decision attributing a percentage of fault to each party. The percentages of fault assigned can range from zero to 100, but must all add up to 100. In contributory negligence states, plaintiff cannot recover at all for any injuries if he or she was at fault at all. In other words, plaintiff must have been completely fault free to hold the defendant responsible for damages caused by defendant’s negligence. Given the harshness of this rule, most states have moved away from this standard. The only ones remaining are Alabama, Washington D.C., Maryland, North Carolina, and Virginia. South Dakota’s standard, only slightly different (and the only one of its kind in this country), allows plaintiff to recover as long as his or her own negligence was only “slight,” though that term is ill defined and difficult to apply. Anything more than slight negligence acts as a total bar to plaintiff’s recovery. Twelve states have adopted a doctrine of pure comparative fault. Pure comparative fault simply reduces the plaintiff’s recovery by the amount of plaintiff’s fault. So if a jury determines that the plaintiff is 1% at fault, plaintiff gets 99% of the damages from the defendant. If a plaintiff is 99% at fault, the recovery is limited to 1% of the proven damages. Most states disagree that a plaintiff that is mostly to blame for his or her injuries should be able to recover at all, which is why most states, including Nevada, have adopted the modified comparative fault rule. Thirty-three states follow some form of the modified comparative fault rule. Under this rule, a plaintiff is allowed to recover from the defendant as long as the plaintiff’s percentage of fault is either (1) less than (i.e. fault amounting to 50% or more bars recovery) or (2) equal to or less than (i.e. more than 50% fault bars recovery), defendant’s fault. Eleven states only allow a plaintiff to recover if his or her fault is less than the defendant’s. Twenty-two states, including Nevada, allow the plaintiff to recover even if plaintiff’s fault equals defendant’s, but no more. NRS 41.141 When comparative negligence not bar to recovery; jury instructions; liability of multiple defendants. 1. In any action to recover damages for death or injury to persons or for injury to property in which comparative negligence is asserted as a defense, the comparative negligence of the plaintiff or the plaintiff’s decedent does not bar a recovery if that negligence was not greater than the negligence or gross negligence of the parties to the action against whom recovery is sought. The law in Nevada—the majority rule in the U.S., which is shared with twenty-one other states— reduces the plaintiff’s recovery by the percentage of his or her own negligence, as long as the plaintiff’s negligence is not greater than the defendant’s. This is sometimes referred to as the 51% rule, though that is a misnomer because the statutes absolve defendant from all liability if plaintiff’s fault is greater than 50%, which means that a plaintiff who is 50.5% at fault is still barred from liability under the statute. If the plaintiff is 0% at fault, the plaintiff will recover $100,000. If the plaintiff is 10% at fault, the plaintiff will recover $90,000. If the plaintiff is 50% at fault, the plaintiff will recover $50,000. If the plaintiff is more than 50% at fault, the plaintiff will recover nothing. Having the right attorney can make all the difference when it comes to convincing a jury how to allocate fault. 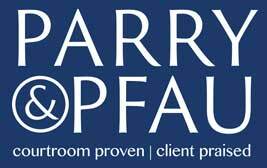 If you’ve been injured by someone else’s negligence, contact Parry & Pfau, personal injury attorneys in Las Vegas, for a free consultation. It is true that in some Nevada car accidents fault is obvious, but it is even more common for fault to be difficult to determine in most crashes. Personal injury cases allow for a victim to seek damages in the form of monetary compensation for harm suffered to both person and property. Determining fault in a motorcycle accident can be difficult and unfortunately, these collisions have a higher fatality rate than other types of car accidents. How Much Should I Get for My Injury? If you have been hurt in an accident that was not your fault, you should receive proper compensation. However, determining how much that compensation should be is not always an easy calculation. Whether you have been involved in a car accident, slip and fall, motorcycle accident or any other kind of accident, answering the question “How much should I get for my injury?” will require some analysis. When Are You Responsible for Your Own Injuries? People get injured everyday, and in some cases, those injuries are a result of someone else’s actions or inactions. In others, you’ve got no one but yourself to blame. As a personal injury law firm, we help people every day to hold others accountable for the injuries they cause. However, in some cases, people are surprised to find out that they cannot hold someone else accountable. One moment you are living an average life and the next you are suffering with a Traumatic Brain Injury (TBI) after someone’s negligent actions put you in the hospital. This is a horrible scenario for the victim and for the victim’s loved ones. If you or a family member find yourselves in this terrible situation, you may be looking for answers as to what you can do to make the situation better.